It has happened. The first arc of Marvel’s Neflix saga has come to a conclusion. 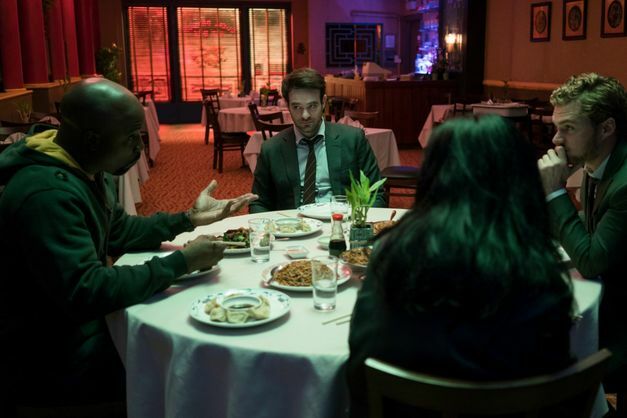 Luke Cage, Jessica Jones, Danny Rand the Iron Fist, and Matthew Murdock, aka Daredevil, have come together for their first joint adventure, and it is magnificent. The Defenders tells the tale of four solitary individuals, very different from each other, with abilities beyond the norm, coming together to face what none of them can face alone. That means both their enemies, consisting of a super-secret and super-deadly association under the rule of a circle of long-lived mystics, and their own inner demons and crappy issues. At stake is the fate of New York City and everyone in it, and that’s just in the short-term. Yes, I had a ton of fun watching this show. It’s only eight episodes long, and those eight episodes are packed with drama, suspense, action, and intrigue. It bears saying: the Netflix side of the MCU is decidedly different from the movies, in many ways. The content, the texture, the stage being set lower to the ground among normal people, etc. One difference is how the shows are more interconnected than the movies. When Marvel released Avengers, it was a movie that brought the characters together, but it was its own independent story for the most part. The same for Age of Ultron. These drew on the material of the preceding movies pretty sparingly. In contrast, Defenders is the next chapter in the lives of all these characters we’ve come to know and love. It brings all of their stories together, intertwining to become one and advance simultaneously. If you have not watched Jessica Jones, Luke Cage, Iron Fist, and both seasons of Daredevil, then you will definitely be lost watching Defenders. This is the first culmination of events that have taken five seasons to tell, not just another installment. At the start of the show, and I am being careful with spoilers here, all four of our heroes are at rock bottom. For Luke, that’s actually a step up, as he’s getting released from prison, his name cleared. Danny is so far down that he’s practically in the sewers, trying to fight a war that he’s been losing so severely that he’s barely even catching up with it. Jessica, far from riding high on her victory over her archenemy, was so exhausted by the entire ordeal that she pretty much collapsed inside and hasn’t managed to pick herself up again. And Matt has hung up his costume in favor of working pro bono for the poor, a choice he can barely hold to, even as he suffers the guilt and pain of loss, almost like his double life was an addiction. Meanwhile, the enemy of everyone, the Hand, stands poised for a devastating victory, one which they are growing desperate for. Throughout the show, and, again, skating around spoilers, these four heroes find themselves working against the same enemy for similar reasons. Somewhat by fate and somewhat by choice, they’re thrown together into the same fight, one that seems crazy and unbelievable at times, but is very real. With their differing perspectives, personalities, and pasts, fighting together comes easy, but working together is more difficult. They clash with each other quite often, they don’t trust each other completely, and none of them are particularly gifted at either leading or following. Ultimately, though, they care too much about others to do anything but make it work in their own weird way. That is in direct contrast with the villains, the Hand. They only think about what they want for themselves, and they think nothing of the lives they destroy and trample beneath them. They may work well together and wield considerable power, but the divisions between them are deep and ready to open wide and swallow them at any moment. When the heroes disagree, things may come to blows, yes, but when the villains disagree, things may quickly become fatal, on purpose. 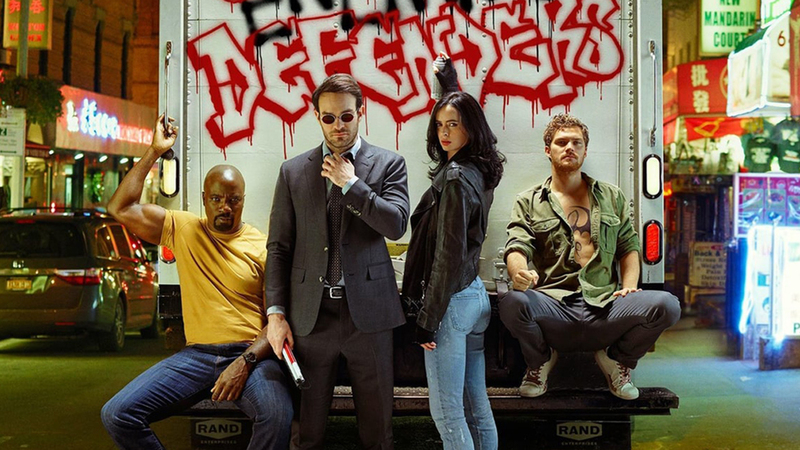 In the end, the story of The Defenders is about getting back up when life has knocked you down, and moving forward. It’s a gripping, riveting tale of character development, and driven by who these people really are. It has thrilling fights, entertaining drama, excellent cinematography, and epic music. And the conflict it details is immediate and powerful, but also believable for how it takes place without the likes of the Avengers or Shield ever noticing it. They can’t be everywhere, after all, which is why people at the ground level need to be heroes too. Not to make it sound flawless, though. I mean, yes, it is excellently well-crafted, well-scored, well-choreographed (they definitely gave Finn Jones more training time than he’d had before doing Iron Fist), well-directed, and well-acted. But, occasionally, they do have little moments of leaning towards campy and dramatic more than sensible and efficient. Some of the fights, however well done, don’t quite flow so perfectly. The Defenders’ version of Daredevil’s famous hallway fight needed some fine-tuning. The supporting cast of the Defenders’ friends are little more than superfluous figures in the background. Also, while I can appreciate the change up in villains, this is at least the third time they’ve done that, and I rather dislike who they made the final villain. I had to groan a little with the ending they cooked up for Matt and Elektra. They totally stretched things and bent Danny’s character a bit out of shape to trump up an excuse for him and Daredevil to have a fight scene. And in the name of sanity, where the heck do the villains get off always saying “For life itself,” when the only lives they’re concerned about are their own? Which, again, they kind of abandon subtlety for, always saying it over a corpse or in a graveyard or something like that. …and how, exactly, did the Hand cause an earthquake? I think my biggest disappointment, though, is probably how the previous series all made a number of promises, and Defenders fulfilled only some of them. I confess, that’s probably because my own fan theory has now been disproven. Oh well, not the first time, but now that we’ve had the Defenders come together to face something mystical, I’m guessing the next arc involves more mad science instead. Well, at least I know I won’t have too long to wait. Punisher is incoming within a few months, and all the Defenders have second or third seasons in the works before they come together again. I am looking forward to all of it. 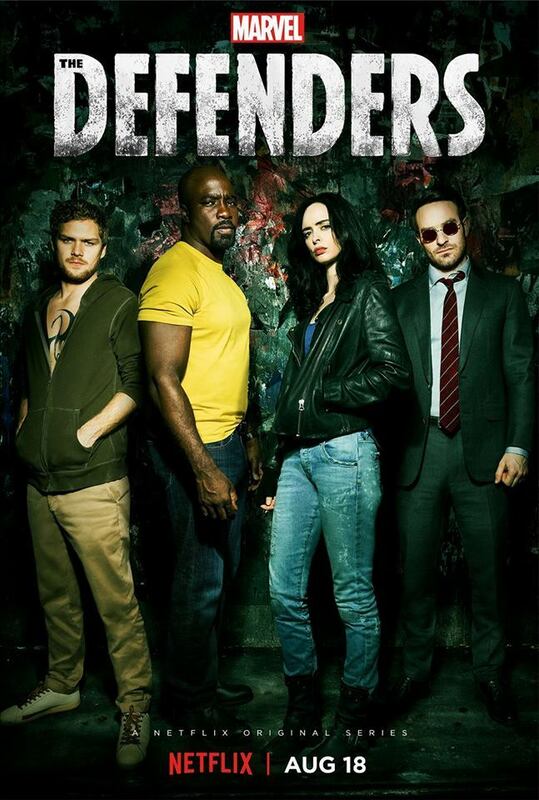 Rating: I give The Defenders 9 stars out of 10. This entry was posted in Tuesday Review, TV Shows and tagged Daredevil, Defenders, Iron Fist, Jessica Jones, Luke Cage, Marvel Cinematic Universe, Netflix. Bookmark the permalink. 3 Responses to Defenders Assemble!